This is my second post on “Home Gym With Only two Equipment”. 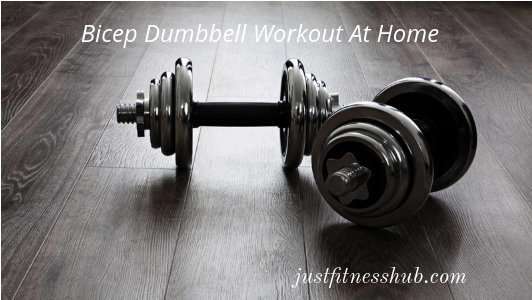 I have started writing this series on dumbbells workout because they’re fairly inexpensive, compact, allow you to tone every part of your body and easy to use even at home. You can perform complete bicep workout with dumbbells at home. In this post I will show you all the best dumbbell bicep exercises that you can do at home. Although you have cable options at a gym, but the best way to build real muscle is with free weights. For training biceps the most effective movement is bicep curl. It is always about curls, but there are different methods to execute the movement such as seated or standing, classic grip or hammer grip, concentration etc. The exercises that I am going to describe in this post are isolation type. There are also compound back exercises that engage bicep as secondary muscles. I will describe them in my next post while talking about dumbbell back exercises. This curl exercise can be done seated or standing. The principle and execution of the movement of these two exercises is same. According to the American Council on Exercise, the abdominal muscles play a larger role in a standing dumbbell curl. When in a standing position, it recommends you brace your torso by recruiting your abdominal muscles to help stabilize your body. This is not required in a seated position. (i) In the standing version, the initial position is to stand with your feet a few inches apart. Keep your core tight and strong to gain stability and balance. Slightly bend your knees to avoid putting pressure on your back. (ii) Keep your chest out and grasp the dumbbells. Extend your arms along your sides with palms facing your body. (iii) Start raising the dumbbell towards your shoulder, one arm at the time. Remember not to move your elbows; your upper arms should stay still. While you curl, rotate your wrist towards the outside (till your palms face up). Try to squeeze your bicep when you reach the top position. (iv) Slowly return to the initial position (hammer grip) rotating your wrist again. This can also be done with the two arms together. (i) Don’t be tempted to swing your body during the movement so as to perform the exercise with heavier weights. The correct form is more important than the weights you lift! (ii) You can do the seated version using a bench with back support to avoid helping the movement by bending your back. (iii) Don’t do this exercise while seating on a flat bench because this way you increase the risk of arching your back or bending. You can try above exercise in a sitting position using a bench with back support. Keep in mind to keep your feet are flat on the floor and your back well supported against the vertical support of the bench. 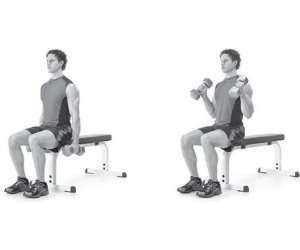 Also the seated curls can be done with two arms together, it’s just my preference to focus on one arm at the time. Same again, it can be done from standing position as well as seated position. It’s most simple version of all hammer curl variations, but one which is still incredibly effective. (i) In the hammer curl the wrists never rotate. From the initial position to the final position palms always face the sides of your body. (ii) The other difference is that hammer curls work the brachioradialis muscles too, which is part of the forearm. Standing hammer curls can be done using both arms at the same time, or alternately but here we’ll be looking at the double arm method. (i) Begin by standing upright. Grab a set of dumbbells, one in each hand at arm’s length, keeping your arms down to your sides so that your elbows are fully extended. Make sure your elbows as close to your body as possible. (ii) Keeping your upper body still and your palms facing each other, and your head dead ahead. (iii) Slowly curl the dumbbells upwards until the dumbbells are roughly level with your shoulders. (iv) Hold and squeeze the biceps for a second and then slowly lower the dumbbells to the starting position and repeat for as many reps as required. Note: Seated hammer curls are great because they help stabilize the back to prevent you from rocking back and forth to gain momentum. This means that the biceps and forearms are forced to do all of the work. 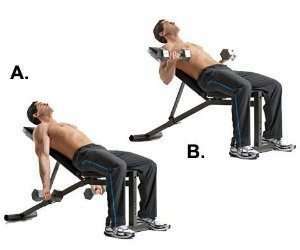 Amongst all the dumbbell bicep exercises, incline seated curls is the hardest. If you are used to one weight for standard your curls, you probably would need lower weight to perform incline curls correctly. The inclination particular angle adds difficulty to the exercise. It is exactly the same as the seated curls, but while you just need a chair for that, you need an incline bench for this one, a bench that you can incline 45 degrees. Then execute the curls like you do with the seated curls. If you want to work more of the brachioradialis, use the hammer grip like described above. Concentration curls is the best dumbbell bicep exercise to shape the peak in your biceps. (i) Sit down on a flat bench or chair (or even on bed) with one dumbbell in front of you between your legs. Your legs should be spread with your knees bent and feet on the floor. (ii) Use your right arm to grasp a dumbbell. Place the back of your right upper arm on the top of your inner right thigh. Rotate the palm of your hand until it is facing forward away from your thigh. Tip: Your arm should be extended and the dumbbell should be above the floor. This will be your starting position. (iii) Keeping the upper arm stationary, curl the weights forward while contracting the biceps. Only the forearms should move. Continue the movement until your biceps are fully contracted and the dumbbells are at shoulder level. (i) When you do the curl don’t move the elbow, it should stay in contact with your leg all the time. (ii) At the top of the movement make sure that the little finger of your arm is higher than your thumb. This ensures a good contraction. Hold the contracted position for a second as you squeeze the biceps. (iii) Slowly begin to bring the dumbbells back to starting position as your breathe in. (iv) Repeat for the desired number of repetitions. Then repeat the movement with your left arm. (i) Avoid swinging motions at any time. (ii) You may tend to curve your back, but in the ideal case you should keep it straight. The one arm dumbbell preacher curl is a good exercise for isolating the biceps and making them work independently. I assume that you are not having a preacher bench at home, but don’t worry. You can try like doing them over the back of a sofa or if you have an incline bench stand up and do over the back of it. You can do the same with a bench and with an exercise ball. The need is to have your arm resting on a 45 degree inclined surface. For this demonstration I am using an incline bench. You work one arm at a time (unless you have a preacher bench) and keep the palm always facing you. (i) Stand on the backside of an incline bench as if you were going to be a spotter for someone. Grab a dumbbell in one hand and rest it across the incline bench with a supinated (palms up) grip and your arm fully extended. (ii) Position your non-lifting hand at the corner or side of the incline bench. The chest should be pressed against the top part of the incline and your feet should be pressed against the floor at a wide stance. This is the starting position. (iii) While holding the upper arm stationary, curl the dumbbell upward towards your chin while squeezing the bicep at the top of the movement. Only the forearms should move. Continue the movement until your biceps are fully contracted and the dumbbell is at shoulder level. Hold the contracted position for a second. (iv) Slowly lower the dumbbell back to starting position until your arm is fully extended. (v) Repeat the above steps to complete your reps and then move onto the other arm for performing the exercise. (i) As a general rule, always hit the weakest arm first. In most cases this is the left arm. (ii) Keep the rep timing slow, and control the weight on the way down. (iii) Focus on only moving your forearm.